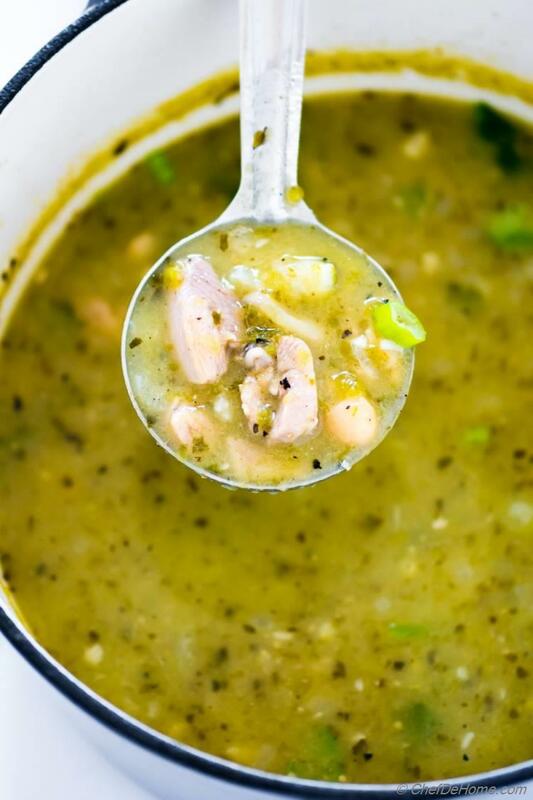 Green Chili - A hearty chicken and white beans chili with green tomatillos and chile base. Gluten free, can be dairy free. 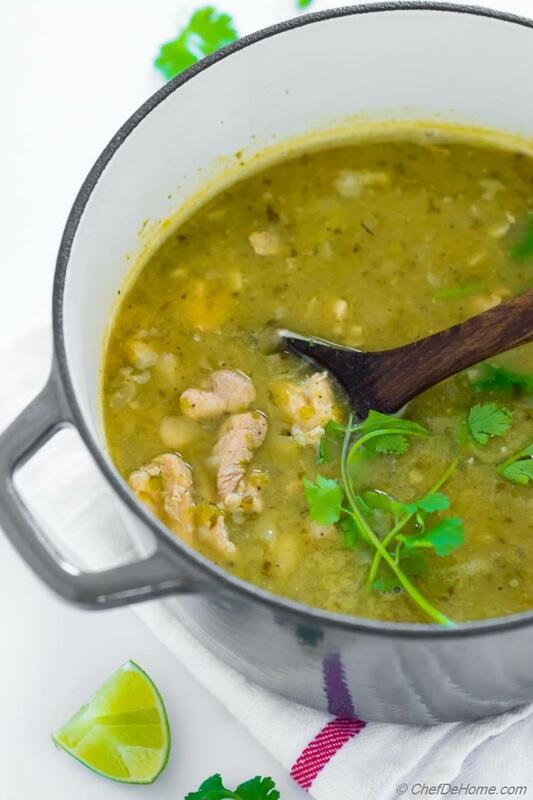 Chicken Chile Verde, or Green Chili as I prefer to call it is a tangy and hearty chicken and white beans stew which gets it's signature green color from green tomatillos. With warmth of spices, heat of chilies, creamy beans and moist chicken.. this Green Chili Recipe will be your perfect companion on a Chilly Night! Gluten free, and can also be dairy-free if you don't serve with yogurt/cream. Since first time I made it for Vishal, I'm often asked to include this recipe in our weekly dinner menu. 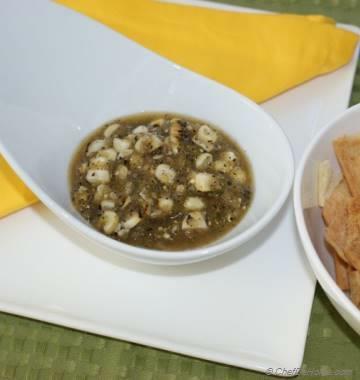 The secret to my recipe and delicious flavors is Roasted tomatillos! I take a few extra minutes and roast tomatillos and chilies on open flame/broiler. This makes tomatillos sweeter and improves the flavor of chilies. Plus the natural smokey flavor it gives to the chili is simply irresistible. Oh, before we head to the recipe.. I must tell you that this recipe can be easily made in slow cooker. In-fact, I have included the instructions in notes for how to make Chicken Chile Verde in Slow Cooker! So, next time you crave for a Chicken Chile Verde dinner? Don't think twice! Just bring home some tomatiolls, chilies, dig few spices from pantry, grab a pot or slow cooker.. and serve homemade Green Chili dinner! 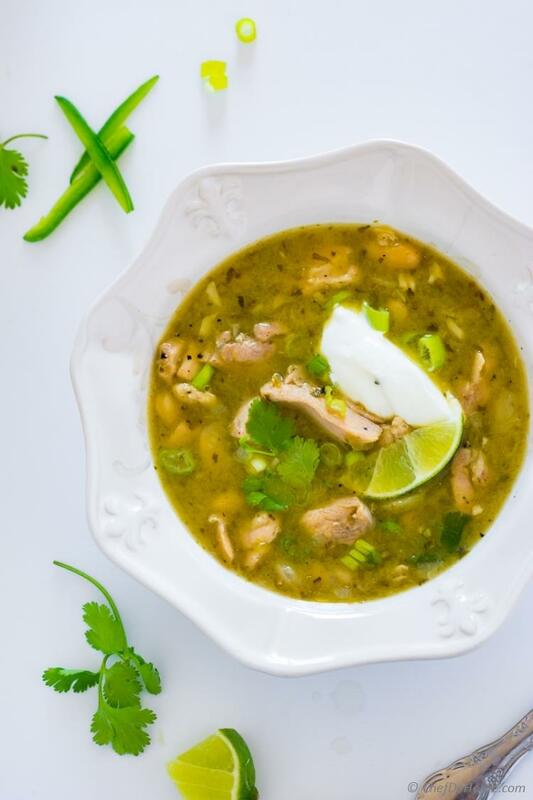 Chicken Chili Verde is a Mexican version of American chili. It is known by name of Green Chili in States like Colorado. Actually, Colorado version of this chili does not have white beans. It is down-to-heart meat chili made with red meat, spices, tomatillos, chilies, and peppers. Often anahiem peppers, poblano, or jalapenos are used for chili flavor and cumin, coriander, oregano in spices. The tang come from tomatiolls and green color from tomatiolls, cilantro, and a bit from chilies. You see, everything works in harmony to make this a one pot Green spiced healthy hearty stew!! In my home, however, there is no Chili without white beans. Plus 90% of the time, we like to add chicken in chilies instead of meat. I use chicken thighs because meat stays more moist and juicy compared to breast. That being said, if you prefer white meat that should be fine too. In this preparation, the acidity of tomatillos and spices tenderize chicken and keep it moist. To balance the heat of spices and make a meal-size hearty portion.. I also like to add some potatoes along with white beans in my Green Chili. Potatoes may not be a traditional ingredient in Chili Verde but these give creamy thick texture to chili without using any starch or thickeners. To prepare Green Chili, I start preparing the ingredients. First, I roast the tomatillos and chilies until skin is charred blistered all over. Once these are off heat and sweat.. I collect rest of spices, dice chicken into bite size pieces, rinse beans, and dice potatoes. The signature green sauce, tomatillos with chilies and cilantro stems is ready in 5 minute. That's all you need to do in prep work. When preparing Chile Verde in pot or dutch oven, I like to saute chicken with spices and salt until it is no longer pink from outside. This seals in lots of flavor in chicken and also flavors the broth. It is important that a good quality chicken stock is used for broth. Or you can follow my trick of adding 2 bone-in chicken legs while chili is simmering. 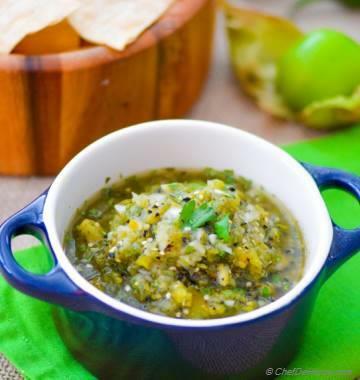 This simple step makes chilie verde taste delicious and adds amazing depth of flavor. 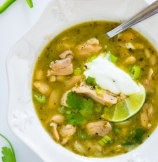 ..making Chicken Chili Verde in slow cooker is even easier!! Follow the instructions in recipe notes. I still recommend making your own roasted tomatillos green sauce because it makes a lot of difference in the taste of this green chili! Total Time 60 minutes Prep Time 15 minutes Cook Time 45 minutes Difficulty Easy Yields 4-5 Servings Serves 5 Notes Number of servings depend on serving size. 1. Remove husk of tomatillos. Roast tomatillos and chilies on open flame until nicely charred from all sides. Put chilies in a plastic bag (or container with lid) and let sweat. Once cooled, scrape off skin as much as possible, and remove seeds. Rough dice and add chilies, tomatillos, cilantro stems and half of leaves into food processor. Process until puréed. Set aside. 4. Add puréed tomatillos-chilies mixture with 1/2 tsp of salt, diced potatoes (if using) with chicken stock. Mix well, bring to boil. Cover. Reduce heat and simmer for 30-40 minutes or until liquid has reduced, chili thickened, potatoes and chicken are fully cooked and tender. Remove and discard bay leaf. Taste and adjust lime juice and salt. If you used bone-in chicken thighs, remove, shred the meat add back in, discard bones. 5. 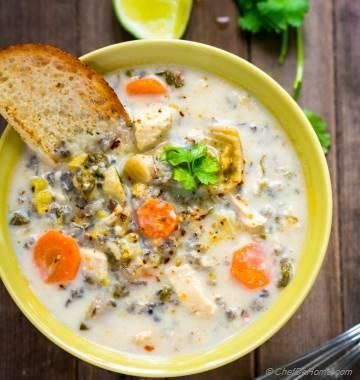 To serve, laddle soup into serving bowls, add fresh cilantro, dollop of sour cream or yogurt. Serve lime wedges and tortillas chips on side. Enjoy! To make chili broth more flavorful, but 1-2 pieces extra of bone-in chicken thighs. Saute these with rest of chicken and simmer in broth. After chili verde is cooked, fish out bones, shred meat, put back into chili. Discard bones. 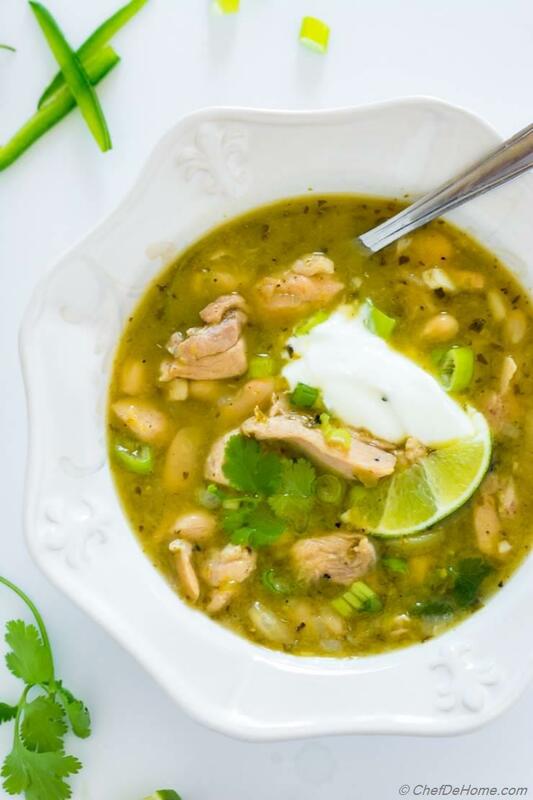 Chicken Chile Verde in Slow CookerChicken Chili Verde in slow cooker, follow steps 1 or use pre-roasted can of tomatiolls. Saute onions and garlic in a pan with some oil. Transfer chicken, spices, cooked onion-garlic mixture to slow cooker pot along with beans, potatoes, tomatiolls sauce. Cook on high for 2.5 hours or on low for 5 hours until chicken is fully cooked and tender. Garnish, serve and enjoy!